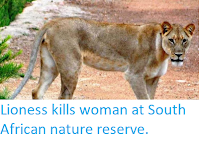 Sciency Thoughts: German tourist attacked by Leopard in Namibia. 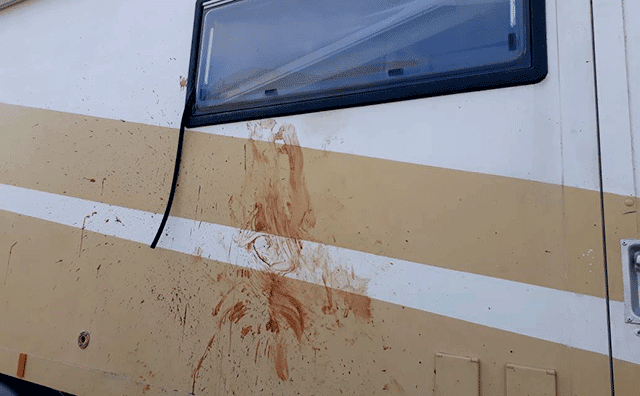 A German tourist has been badly mauled by a Leopard in Kuiseb Canyon in western Namibia on Thursday 12 April 2018. Hardy Specker, 61, was sleeping in a camper van with a window open when he heard the animal scratching at the vehicle. 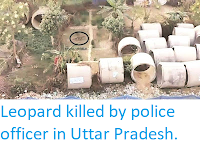 He attempted to close the window but was seized by the Leopard, which attempted to drag him out of the vehicle, while his partner attempted to pull him back in. 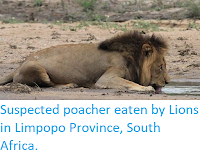 Eventually the Cat released him, leaving him with severe lacerations, but stayed close by, preventing either passenger from leaving the camper. Eventually they were able to alert a passing motorist to their plight and Mr Specker was taken to a hospital in Walvis Bat for treatment. Bloodstains on the side of a vehicle that a Leopard attempted to drag a tourist from. The Namibian. 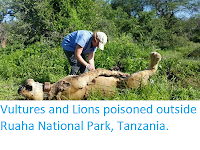 Leopards, unlike most animals., are natural predators of Humans and will often attack us if the opportunity arises. They are also extremely flexible in their habitat requirements, and can adapt to live in Human-modified environments quite readily. 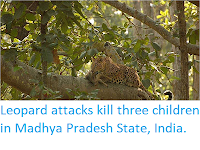 Humans will generally do their best to avoid this, and in areas where Leopards are found tend to take precautions, such as building secure barriers around villages or killing the Leopards. Leopards are considered to be Vulnerable under the terms of the International Union for the Conservation of Nature's Red List of Threatened Species, due to habitat loss, licenced hunting, poaching for the illegal wildlife trade and loss of prey species, though Southern African populations have been less depleted than populations in other parts of Africa and Asia. A Leopard killed by a hunter in Namibia. Wikimedia Commons. Share this to help a soul right now, Ya'll will agree with me that the rate of online scamming is increasing by the day. I'm also a victim of it as i was scammed about 25,000usd all in the quest of seeking for an home loan. I actually gave up until a government official directed me to PROSPER LOAN FIRM, Despite the fact of my plight i had to give it a try since it was coming from a top government official. All comment ya'all see online are crap, I know the pains i went through just because i was looking for a loan i had to keep on selling valuables to keep paying unforeseen fees. I and some great personality have started a movement to end online scam because people are dying everyday, losing their homes, selling their property just because they need a loan. Apart from been a beneficiary of about 295,000usd in PROSPER LOAN FIRM lending scheme , We have also made a research to see that they are the best around the globe as far as online lending is concern, They have proven their self trustworthy and reliable back to back without failing. To end people debt, financial burden and been victimized here is the details of prosper loan firm. Email: prosperloanfirm@yahoo.com OR call +1(816) 366-8769 to put an end to your financial needs now. I'm Heather Patrick from Georgia, United States. It doesn't take you anything to share this great information and good news. Email: prosperloanfirm@yahoo.com OR call +1(816) 366-8769 and celebrate financial outbreak for the rest of you ==============r life. Nice article. Thanks for sharing content and such nice information for me. I hope you will share some more content about. German tourist attacked please keep sharing!